2. Chili with beans over rice. Instant rice is the way to go for this busy momma! Plus, what’s easier than microwaving a can of chili and cooking up 2 cups of rice. Right now the kids are still younger and don’t eat as much chili but I think in the next year or so I’ll have to up the can of chili from the 15 oz to the 38 oz. $5 for 38 oz can and $1.47 for 2 cups of instant rice. A hearty meal for $6.47 for a family of 5. 3. Soup and grilled cheese sandwiches. It takes a lot of soup to feed a family of 5. That’s why I’m so glad my kids love ramen noodles. For this meal I need two packs of ramen noodles, 10 slices of bread, 5 slices of cheese, and butter. It’s $0.75 for the two packs of ramen noodes, $0.45 for 10 pcs of bread, and $0.92 for cheese. I’m not sure about how much butter I use but am guessing maybe $0.25 worth? Total for this meal – $2.37 for a family of 5. 4. Breakfast at Dinner! Sometimes it’s just fun to each breakfast for dinner at our house – scrambled eggs and waffles. $1.38 for a box of 10 count store brand frozen waffles, $1.50 for a half a bottle of syrup, and $0.60 for 6 eggs (when on sale). Grand total for this meal $3.48 for a family of 5. 5. Chicken nuggets with green beans and tomato slices. Ok, I know that each of these meals have lots of carbs but at least the one is a bit less than the others. I can get a 70 oz bag of nuggets for around $9 and only use 1/4th of it at a time. Right now our family only eats one can of green beans a meal. Roma tomatoes are generally the least expensive around here and my kids like them a bunch. I can get 1 pound of roma tomatoes for around $1. $2.50 for chicken nuggets, $1.50 for a can of green beans, and $1 for the tomatoes. Total meal cost is $5 for a family of 5! 6. Frozen pizza night. We are getting to the point that we can eat 1 Red Baron or Tombstone pizza with no trouble. This meal is usually during a movie night so that means they will be snacking on popcorn later as well. 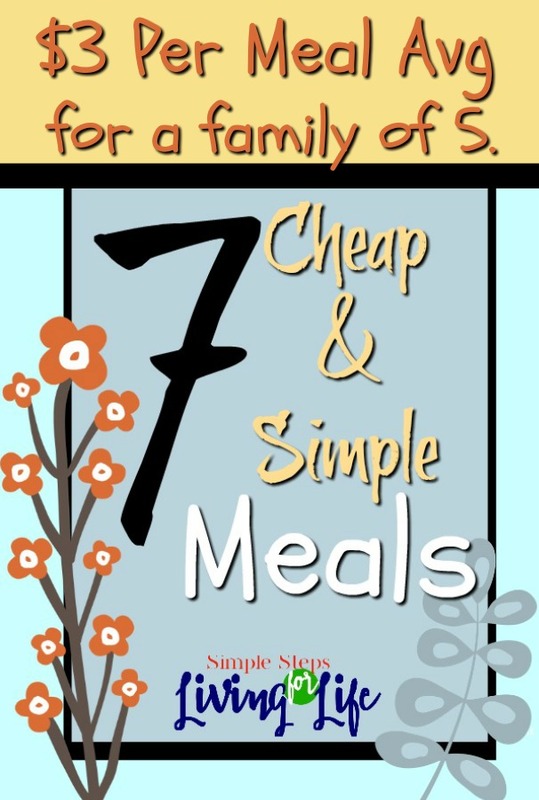 Total meal cost is $4.40 for a family of 5! (Again, I’m not getting sponsored by mentioning a favorite food item. BUT if you’re listening Tombstone, I’d love a years supply! LOL) 7. Homemade soup. Anytime we have a meal that includes leftover vegetables and beans, I put them in a large plastic butter tub and store it in the freezer. When it is almost full, I set it in the fridge to thaw overnight. In the morning, I put a can of stewed tomatoes and the thawed veggies into a crock pot. Sometimes I add a can of water or two depending on how much is already in it from the thawed veggies. I season with my favorite spices – garlic salt and pepper and sometimes dried Italian seasoning. Cook on low until dinnertime &Viola! If you don’t have a crock pot, use a stock pot just before dinner and put everything in it and bring to a boil. Then turn the heat down to low and let it simmer for a long while. Total cost is just from the can of stewed tomatoes – $0.55 for a family of 5. 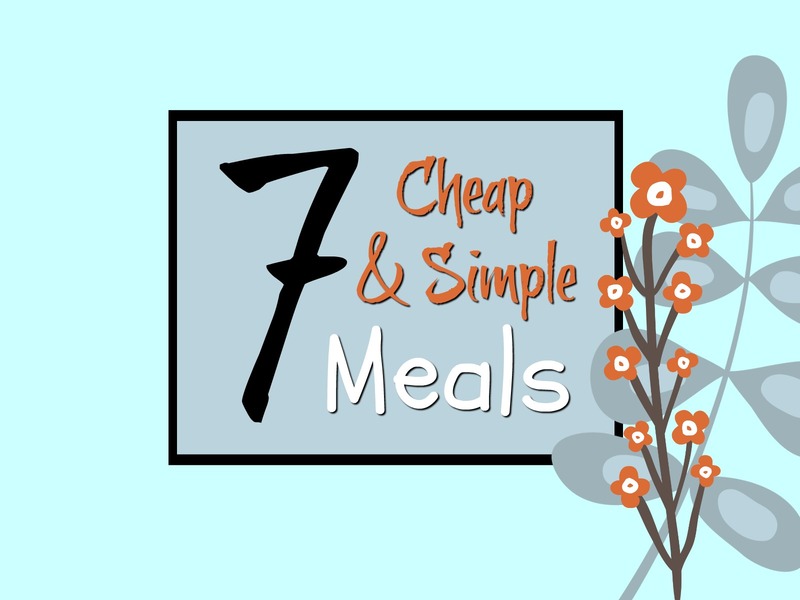 The total dinner meal cost for one week for a family of 5 is only $21.17! I probably could do this for even cheaper but am just being realistic for what I actually do. That’s literally cheaper than one meal at McDonald’s AND we have a play land, of sorts, in our backyard! LOL And don’t even get me started about how it’s so much cheaper than a sit down restaurant. What types of dishes, pans, and pots do you need to cook these meals? Not too many. Check out my affiliate links for what you can use to make these meals(see my disclosure page for more information). For cooking noodles, rice, or soup use a stock pot and if you are lucky use a crock pot. For grilled cheese and scrambled eggs, use a frying pan. For pasta sauce, chili, chicken nuggets, and green beans you’ll need dishwasher safe bowls or plates (Or buy a dinnerwear set that can be used for serving, microwave cooking, and for using for meals) For the chili and green beans don’t forget a can opener. If you prefer the chicken nuggets to be cooked in the over verses the microwave then pick up a cookie sheet. And to slice up the tomatoes or any fresh veggies and fruit, pick out a good knife and cutting board so it doesn’t ruin counter tops. For more Marvelous Tips Mondays click here.